As mobile learning becomes more and more prevalent, we must find effective ways to leverage mobile tools in the classroom. As always, the tool must fit the need. Mobile learning can create both the tool and the need. With safe and specific structures, mobile learning tools can harness the excitement of technology with the purpose of effective instruction. Using QR codes for instruction is one example of this. QR stands for Quick Response. It's basically a quick, scannable barcode-like image that takes you to a specific digital destination. The one to the right, for example, will take you to a QR code generator. There you will be able to create all sorts of QR codes. (Feel free to search the web for them.) Before that, however, you will need an app that reads the QR codes. There are plenty of free QR code apps to download for Android and Apple Products. Just search. To read them, all you need is a phone with a camera. Free makes teachers happy, and of course makes the implementation of these practices easier. QR codes can send you to a link, mobile number, email, SMS, bookmark, link and more. 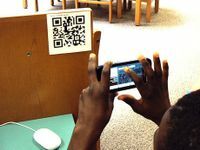 Mary Beth Hertz did a great introductory blog on QR codes and mentioned ideas like scavenger hunts and advertising for the classroom. Below are some more ideas to give you a starting point for using QR codes. Have students use QR to create resumes that link to other content such as their professional website or portfolio. All schools do some level of resume building and technical writing. Help them bring it into the 21st century by creating a resume that requires interaction. Not only will this help engage them in technical writing, but also their work will be innovative. You can create QR for linking students to examples of quality work, whether it's PowerPoint or slideshare for a class presentation, or people speaking a foreign language specific to your current lesson. 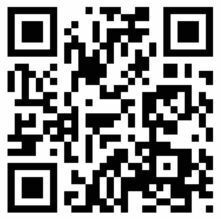 Integrate QR with a PBL or Service Learning project where students can create the codes that will link to the content they create. If students helped create awareness around spreading germs, for example, they might put the codes around the school or in a parent newsletter. They can take it a step further by creating codes for a local business or organization. Save a few trees! Instead of making more printouts than everyone needs, give your students a QR that takes them to the instructions, announcement or assignment. It can save you space on your wall, and keep your classroom greener. Award prizes by having students scan a code leading to an animation or badge. When they pass a test on commas, perhaps they get a code that takes them to a badge for Comma Guru! Students can even create their own codes to award each other. When a student sees something great happen, they can give a code that links to messages such as "Good Job from Andrew" and "Thanks for doing your part for the team." Put codes in different areas of the room that will take students to different online activities, videos or content. Using a great tool like the discussion protocol of reciprocal teaching (PDF) or a graphic organizer will help facilitate their interaction with the linked content. Have students check their answers by scanning the QR code after completing a test or assignment. As a teacher, you can visually confirm when students are checking their work and can also check in to see how they are doing. This will help track individual learning and can provide an opportunity for you to facilitate student reflection. A great way to provide optional activities for students who want to excel is to simply put the code on the class assignment and let them follow it to the extension activity or question. It won't take up much space, and might facilitate a little excitement about the extension assignment. Have students create codes linking to items discovered during research. These could be posted in class wikis on a specific topic, or on a wall in the classroom. It helps give them ownership of the research process and literally creates "walls that talk." Codes attached to a skeleton model or dissected pig can take students to important directions or content. Or vice versa. Maybe this will help them to create the lab themselves or make a model for the class lab. Perhaps you have a poem for students to analyze. You can provide additional scaffolding with a link to a recitation or focused questions to get them started. Use the QR to help you manage differentiation of the various strategies in your tool belt of teacher practices. QR codes can be a great voting tool allowing students to vote by simply scanning the code as they enter or exit the classroom. This can save time, and it gets your students up and moving. QR codes are a great arsenal for the teacher tool belt. Just remember, this technology is a tool and needs to fit a purpose. It can help create engagement in a lesson, manage your classroom, be part of student work or facilitate inquiry in a project. Please comment below and give us some or you best examples of how you use QR codes in the classroom. I like to say, "The wisdom is in the room." You are all rockstar teachers, so I would love to hear your ideas.